The French leader has promised an extra €2 billion per year to finance the fight against climate change in the Global South. EURACTIV France reports. France has pulled out all the stops in its effort to boost the level of international ambition ahead of the United Nations Climate Conference, which will take place in Paris this December. 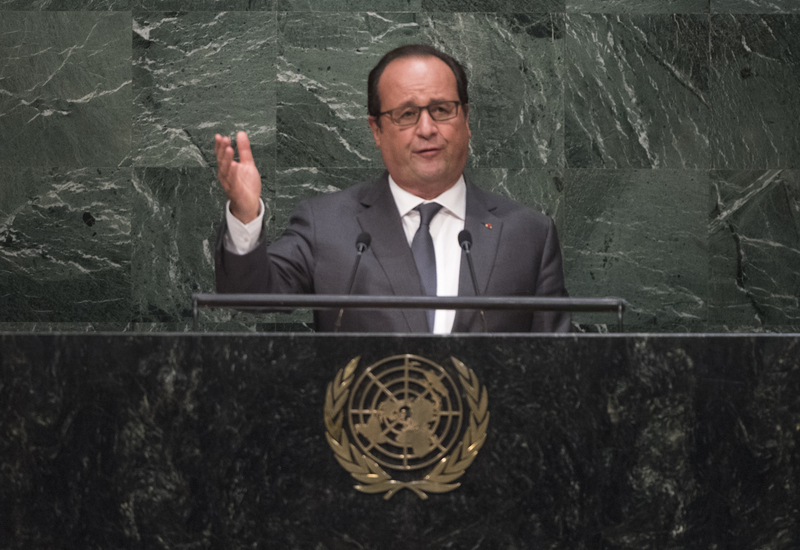 In his address to the 70th United Nations General Assembly this week, François Hollande promised a significant increase in France’s climate financing effort. By 2020, Paris will spend an extra €2 billion per year on the fight against climate change, bringing France’s total contribution from €3 billion to €5 billion. Romain Benicchio from Oxfam France welcomed the move. “By stressing the importance of grants to fund adaptation to the already catastrophic impacts of climate change, François Hollande has clearly responded to the expectations of the most vulnerable people. Just two months before the COP21, this announcement could help change the dynamic of the negotiations,” he said. The French announcement was timed to give a shot in the arm to the talks on financing adaptation to climate change in developing countries, where progress has been particularly slow. The annual $100 billion climate adaptation fund promised by developed countries to help developing countries adjust to and combat climate change by 2020 has so far failed to materialise. The latest negotiations in the lead-up to the COP 1 have been undermined by the weakness of the commitments made so far. Before the French announcement, only $17 to $20 billion per year of public money had been promised to developing countries. “We can take nothing for granted with the COP, anything is possible,” said François Hollande. “Some might say ‘it can happen later at another conference’. But if it does not happen at Paris, it will not happen later, it will be too late for the world,” the French president added. So far, 90 out of the 193 countries participating in the international climate negotiations have published their national contributions. But all the contributions combined are still far from enough to keep the global temperature rise below +2°C by the year 2100. A simulation by the NGO Climate Interactive found that all the UN’s current commitments combined would limit the temperature rise to +3.5°C, as opposed to +4.5°C with no action from the international community. To raise these extra funds, France hopes to lean heavily on the Financial Transaction Tax (FTT), a severely delayed tool that is now scheduled to come into force in 2017. “Before the Paris Climate Conference, François Hollande will have to meet with other European leaders to discuss the allocation of the FTT revenue and to convince his European partners to use it as an innovative financing tool for the fight against climate change,” said Romain Benicchio. France is not alone in increasing its climate financing efforts. In May this year, Germany announced that it would double its finances to €4 billion per year. The United Kingdom will also increase its financial contribution to the fight against climate change in the global South by around 50% over the next five years, to £5.8 billion. Negotiations on climate change began in 1992, and the UN organises an annual international climate change conference called the Conference of the Parties, or COP. Paris is hosting the all-important 21st conference in December 2015. The participating states must reach an agreement to replace the Kyoto Protocol, the object of which was to reduce CO2 emissions between 2008 and 2012. Reaching an agreement, whether legally binding or not, is the priority between now and December. The Green Climate Fund was created during the climate conference in Durban (South Africa) in 2011. The objective for developed countries was to raise $100 billion a year by 2020. An initial capitalisation objective has been fixed at 15 billion dollars for the next three years. This money will be used to help poorer countries to limit their greenhouse gas emissions and adapt to the effects of climate change, but it will only go some way towards covering greenhouse gas reduction targets. The global cost of cutting emissions to sustainable levels is estimated at between 500 and 1,500 billion euros per year. France is the greatest environment diesel infector and likes to finance a “climate change” by money ! They are doing already very well without to finance …..